Game contents and software © 2004 Rebellion. All rights reserved. 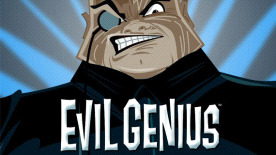 Evil Genius and the Evil Genius logo are trademarks of Rebellion. All rights reserved. Elixir Studios and the Elixir Studios logo are trademarks of Rebellion. All rights reserved. All other trademarks are property of their respective owners.